This is the third post in our Lightning 101 For Exchanges series. 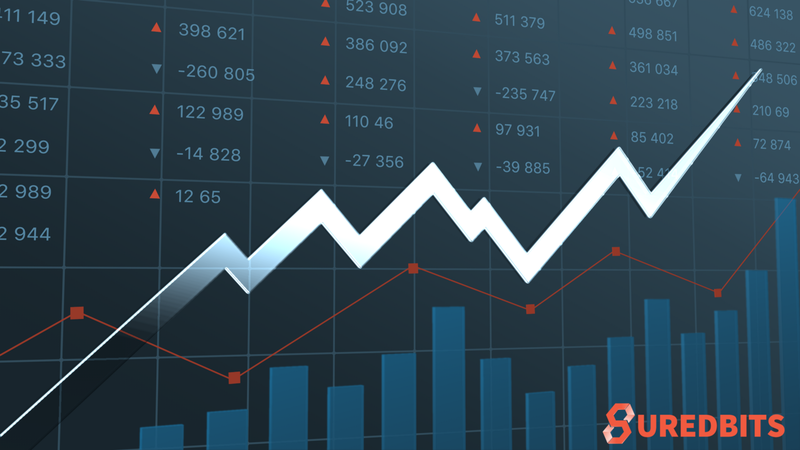 In this post we explain why crypto exchanges can feel confident in adopting Lightning for their business operations while complying with regulatory requirements. For purposes of this analysis we will be focused only on the rules within the United States. In our last post we explored Money Transmitter Rules (MTR). We outlined how they shouldn’t apply to the Lightning Network and result in strange outcomes when they do. In this post, we want to consider the most conservative legal position a crypto exchange could take to protect themselves and ensure that they do not run afoul of MTR. Essentially, routing transactions on the Lightning Network (LN) is entirely optional. That is, any node can decide whether they wish to route payments along the network or not. You can decide to just accept and send payments and not route payments on the network. (For more detail on how routing works on the Lightning Network, check out our previous post here). 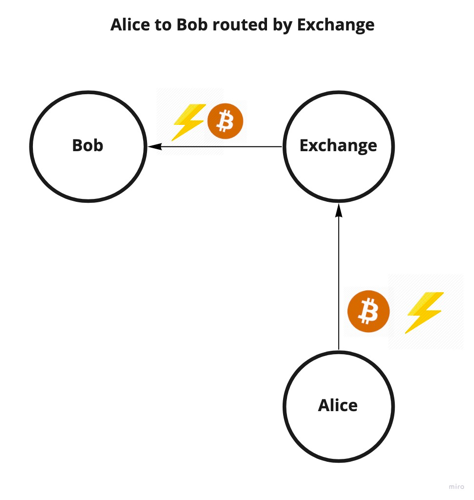 Alice pays Bob via an exchange routing the payment. Note, “Exchange” could be any person but for purposes of this post, we will stick with an exchange. Now let’s introduce another person, Carol, to this chain of transactions. Carol wants to send her bitcoin to Bob. Carol doesn’t need a connection to Bob. 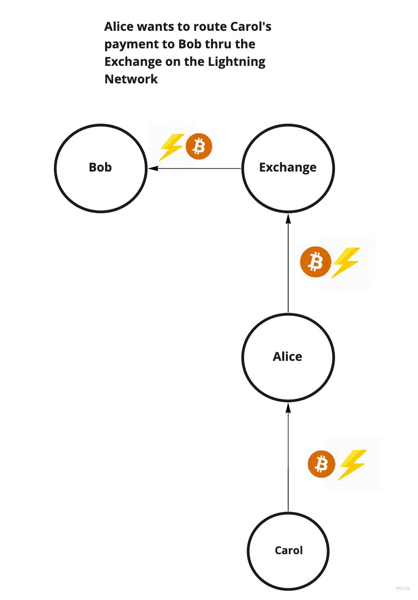 The Lightning Network can route her payment through Alice, through Exchange, to get to Bob. This may appear like a typical money transmission situation but as we point out in our previous post, it really is not since Exchange isn’t holding any funds and wouldn’t even know the money is coming from Carol. It’s more like a find-and-match — like a Craigslist — than routing payment to specific persons or entities such as, for example, Western Union. At the end of this chain, Carol routes her payment to Bob and LN makes it possible via routing. Here we see Exchange has decided not to route payments. This is an an over-simplified version of events as the Lightning Network has routed thousands of transactions even in these early stages. But it illustrates that an exchange can conduct normal business operations — payment, deposits, withdrawals, etc. — with its customers via Lightning Network and choose not to route payments. It is worth mentioning, that even in the scenario where Exchange is not routing transactions, Carol can still deposit and withdraw funds into Exchange if she so chooses. Likewise, Alice can conduct her business with the Exchange as well. They just can’t route a payment to Bob thru the Exchange. It should be evident now that when running a node on the Lightning Network, Exchanges have the autonomy and ability to control how they wish to use their node. They can interact with the Lightning Network and route payments freely or, if they choose to for business purposes, decline to route payments and only interact with their customers. 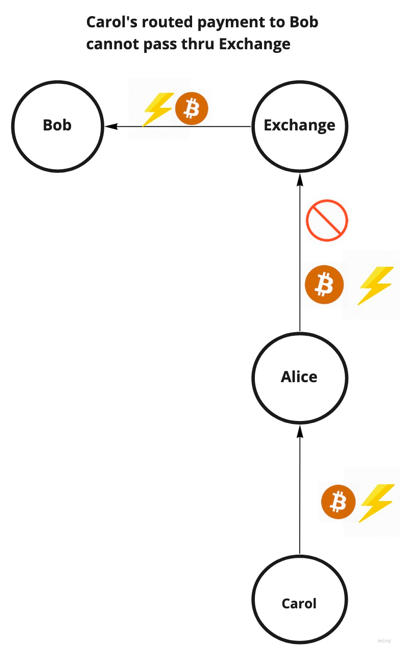 Lightning extends and scales the Bitcoin protocol. And like Bitcoin, Lightning puts control over funds into the the hands of the person. Money Transmitter Rules (MTR) are intended to govern entities that act as custodians of other people’s money; holding and transferring their funds when necessary. MTR is intended to protect consumers from being defrauded, their funds stolen outright, or money transmitters from engaging in money laundering. As we have shown, actors on the Lightning Network aren’t custodians of other’s funds — they are routing transactions along a peer-to-peer network. The critical issue is who controls the funds. The bitcoin protocol and Lightning Network have been designed to put control in the hand of the individual person or entity. As such, many of the policy goals of MTR are already in place. Additionally, no Lightning Node operator — in this context we mean specifically crypto exchanges — have to route payments along the network if they choose not to. They can still use Lightning as a way to scale the advantages of the bitcoin protocol for their business operations. In future posts, we will explore the benefits for crypto exchanges to adopt Lightning technology and Network into their business. If you’re interested in chatting more about Lightning Network technology or crypto tech in general, you can find us on Twitter @Suredbits or join our Suredbits Slack community. You can also reach us on the Lightning Network: 038bdb5538a4e415c42f8fb09750729752c1a1800d321f4bb056a9f582569fbf8e@ln.suredbits.com. In December of last year Suredbits released the first ever cryptocurrency market data API where you can stream data and pay for it all on the Lightning Network. Lightning 101: Why is the Lightning Network Secure? Director of Product & Operations @Suredbits www.suredbits.com.